Japan, 1373. A lone samurai warrior strides into the compound of his shogun. 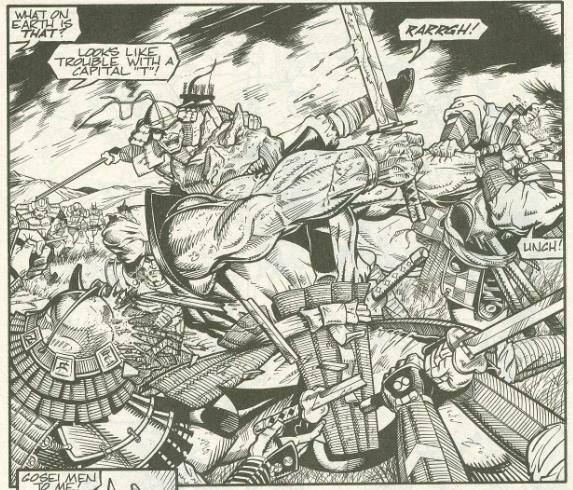 The samurai is Chote, a mutant lizard, and the shogun is a large man in a demon’s mask. Chote reports that he was besieged by Ogara’s warriors, but killed many. He reports back that the news is that his master’s rival, Ogara, has consolidated his forces but is near death and losing his wits. The shogun is pleased because, although his magic is weak, he’s coming closer to obtaining the secrets he desires. The shogun muses that if he fails, he’ll remain trapped in this primitive country, but if he succeeds, he’ll be able to eliminate all of the Gosei clan. Northampton, 1992. At the farm, the Turtles are killing time playing Scrabble when Hattori comes collapsing onto their doorstep. Splinter communicates with their old friend via the Astral Plane, as he is in too much spiritual turmoil to explain his dilemma. Splinter discovers that a malevolent force from the past is attempting to possess the Gosei Spirit (the ancestral mind-link of the Gosei legacy passed down countless generations) to enter into the future. The evil force, according to Splinter, does not belong in the past and is actively changing history. The only way to stop it is to travel back to Feudal Japan, where the creature lurks. The Turtles think that’s nuts, as they have no means of time travel. Splinter tells them to be patient, as they have experienced time travel before and may do so again. Later, while sparring out in the yard, there’s a great flash of light and, you guessed it, Renet appears! Renet explains that helping the Turtles was merely next on her Timestress to-do list (right after clearing up “that whole Sarah Conner thing”). The Gosei Spirit is well-known amongst the Timestresses, as it is an early example of temporal dabbling, hence how she was aware of the problem. Renet offers to give them a lift back to Feudal Japan and, firing up the sands in her Time Scepter, shunts them all backward a few centuries. 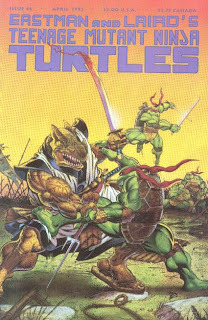 The Turtles come to on a battlefield in Feudal Japan, right in the middle of a brawl between Ogara’s forces and the unstoppable monster, Chote. Raph leads the charge against Chote and the Turtles, reluctantly, go to help their hot-tempered brother. Chote is overwhelmed by his skilled attackers and retreats. Leader of the samurai forces, Mito Toraga, greets the Turtles. He is hesitant about trusting them, as they’re not only monsters but ninja, yet he accepts that they helped him in his time of need. Leonardo recognizes that Toraga wears the symbol of the Gosei Clan and explains that he and his brothers were sent by their sensei to help Toraga’s master. Toraga, however, fears that they are too late. Back at the compound, Chote returns to his shogun with news of the four shell-backed creatures and a blonde woman with a scepter who interrupted his battle. The shogun, furious, strikes Chote and tells him that under no circumstances can he allow the blonde woman to escape. Chote, indignantly, obeys the command. *Chronologically, I would place this story after TMNT (Vol. 1) #27. The story continues in TMNT (Vol. 1) #47. *For the Turtles, they last met Renet in TMNT (Vol. 1) #42. However, given that Renet was more mature in that story and she’s less mature in this one, from Renet’s POV, she likely last met the Turtles in Tales of the TMNT (Vol. 1) #7. Time travel. You know how it is. *Chote is the same character as Shogun Shoate from the Playmates TMNT toyline. *The Turtles last met Hattori in TMNT (Vol. 1) #9. *This issue also featured a 4-page sketchbook promo for Stan Sakai’s “Space Usagi” series. Hey, it’s like the third live-action TMNT movie only, you know, not absolutely horrible. Hooray! Seriously, you can look at “Masks” and tell that it was the blueprint for “TMNT III”, just with the budget scaled back tremendously. The time scepter is there! But no Renet because trying to explain her history might cost too much. Feudal Japan is there! But no giant lizard men because that sort of costume would be too expensive. There’s an evil shogun! Except he’s not a demonic creature because we gotta think about the bottom line, people. 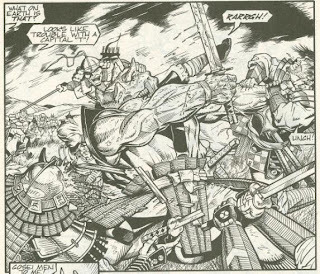 If you’ve ever wanted to see a good “Turtles go back to Feudal Japan, fight an evil shogun and engage in samurai battles” story, then “Masks” is really where you ought to be headed. 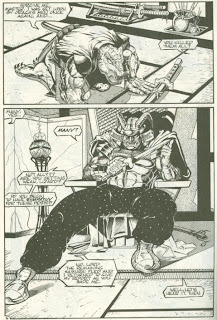 Looking back at the overall landscape of Mirage’s TMNT comics, I’ve realized that Dooney only drew a scarce number of full issues; his talents were typically reserved for covers, shorts or lithographs and other bits of prestigious art. The man is an incredible talent, so any full issues done under his pen and pencil are to be savored. Here, Dooney takes a wonderfully cinematic approach to the story (the opening editorial explains he was coming off a “samurai kick” when he wrote this) with two beautiful establishing shots on the first three pages. He exerts a tremendous amount of effort in capturing the detail and authenticity of the Feudal era landscape and fashions and totally delivers on the look and feel of the setting. I suppose one obvious omission are any kanji of any kind, but I understand those aren’t easy for artists and writers unfamiliar with the language, and I’d frankly prefer their absence over “squiggly lines that kind of look right”. We get something of a double-whammy in regards to returning characters and plot threads, as not only does Hattori make a comeback, but so does Renet. I always felt Hattori had potential to be an interesting supporting character in the Mirage series, but they mostly squandered him. The Turtles and Splinter tend to have more experience with the Gosei Spirit than Hattori-himself. Renet, meanwhile, is more youthful and ditsy than when he last saw her in “Juliet’s Revenge”, indicating that that story happened later in Renet’s timeline. Dooney draws her with the same supermodel body type he gives to all his female characters, but in Renet’s case, it’s actually an accurate fit considering her exaggerated anatomy. At least she’s not wearing that stupid hat. As for the new guy, Chote, he doesn’t have much personality but he sure does look cool, right? “Masks” starts out strong with an exciting opener, though it'll taper a bit in the second half. The arc is also a sort of “last hoorah” for weirdness and random adventure before “Shades of Grey” and “City at War” absorb the last fifteen issues of Volume One.